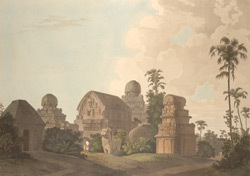 Plate 1 from the fifth set of Thomas and William Daniell's 'Oriental Scenery' called 'Antiquities of India.' Mahabalipuram, on the coast of India south of Madras, is known for its early group of temples and monolithic sculptures from the time of the Pallava dynasty in the 7-8th cenuries AD, when the site was the port for their inland capital at Kanchipuram. The 'Pancha Ratha' form a group of five temple-monoliths carved out of granite to resemble raths, the wooden chariots used during religious processions to carry the statues of the divinities. Next to the shrines are a monolithic lion and elephant, the vahana or vehicles of the gods.